Pure Landscape Photography is Very easy and if done following all the Rules of Landscape Photography .......Its Very Very Tuff. Like these Photographs..
What is wrong with these Pictures. Simple they are not following the most Important Rules of Landscape Photography. What are Those Rules ??
" Tic Tac Toe " on your Photograph.
" Horizon Line (BLUE LINES) "
and 2 vertical lines 90* degree to horizon lines. "Point of interest (RED CIRCLES) "
We need to keep the Horizon on the Upper or Lower 1/3rd Line and any subject or interesting thing in Photograph should be on the any of the 4 points of Interest. This is the First and the most powerful rule. Point of interest is a place in a frame where human eye and brain give max emphasis when you see a photograph. 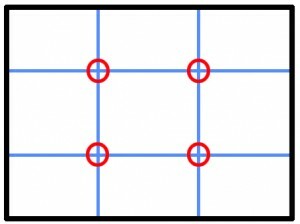 Rule of Thirds can be applied on any photograph and for all practical reasons it can be applied on all types of photography not just The Landscape. 3. Sense of Depth - Always try to add a Human subject in your Landscape Photograph , It gives a Sense of Depth or idea about the Size of the Landscape when viewers compare it with human size. If we do not have a Human subject available for this comparison then It can be Animal subject / House / or even a Electric Pole any article whose size is well known to all of us. Their are many more rules for landscape But i feel " Rule of Thirds " Horizon and Sense of Depth are the most important needed to be clear . Please practice these 100 times before reading further about landscape Photography. SHOULD NOT START FROM CORNER but it must GO TOWARD THE CENTER of the Frame predominantly. Should make ENTRY IN THE FRAME not exit. try to place your point of interest or human subject or any thing in your photograph in such a way that they should make their ENTRY in the frame Not Exit. Subject is making entry in the frame because she is facing & walking toward the Center of the frame . Subject is making a Exit from the frame because he is walking Out with Body facing outside the frame. These are few Rules which makes The Landscape Photograph looks better then others. please try and discussion and suggestions are welcome on my e.mail and on this Blog. Thanks for giving important basic tips, these are really helpful.